The Abu Dhabi Grand Slam Tour returns to London, and they're bringing another edition of their stacked super-invitational "King of Mats". The 10-man -69kg event will take place on March 10, the final day of the Abu Dhabi Grand Slam. The event organizers select the 10 competitors from past Abu Dhabi World Pro and Abu Dhabi Grand Slam winners, meaning only the most elite world-class black belts qualify to appear. The first names confirmed for the round-robin event are Paulo Miyao and Gianni Grippo. The 69kg athletes both took significant wins in 2018, with MIyao being crowned Abu Dhabi World Pro champion over Grippo and Grippo besting him in the final of the Abu Dhabi Grand Slam in Los Angeles later that year. King of Mats is one of the few events that uses a round-robin format– meaning the 10 competitors are divided into two groups of five. The competitors will face every member of their group in turn, accumulating points base on their method of victory. The top two athletes with the most points from each group face off in a four-man elimination bracket. Matches are six minutes long and use standardized jiu-jitsu rules. 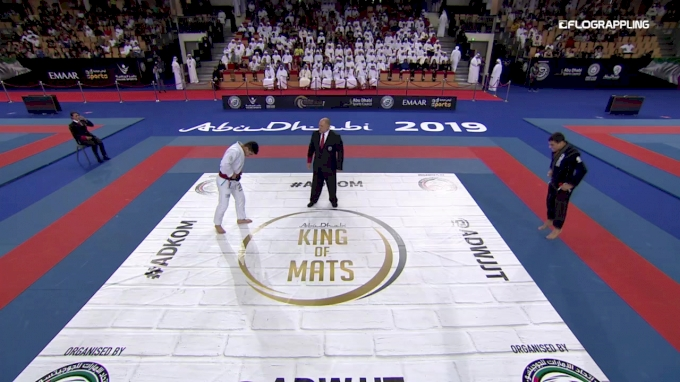 Past King of Mats events saw Gabriel Arges crowned champion in Abu Dhabi in January 2019, and Erberth Santos take the title in September of 2018. The series made its debut in April 2018 at the Abu Dhabi World Pro, with Leo Saggioro, Charles Negromonte and Alexander Trans being crowned lightweight, middleweight and heavyweight Kings. It is expected they will defend these titles against the 2018-2019 tournament winners at the Abu Dhabi World Pro in April 2019.